this guy loves water in any format. when we're in the kitchen he jumps in the kitchen sink multiple times per day. it's not uncommon to see him in the bathtub or bathroom sink either. he loves to get wet and loves to drink water. 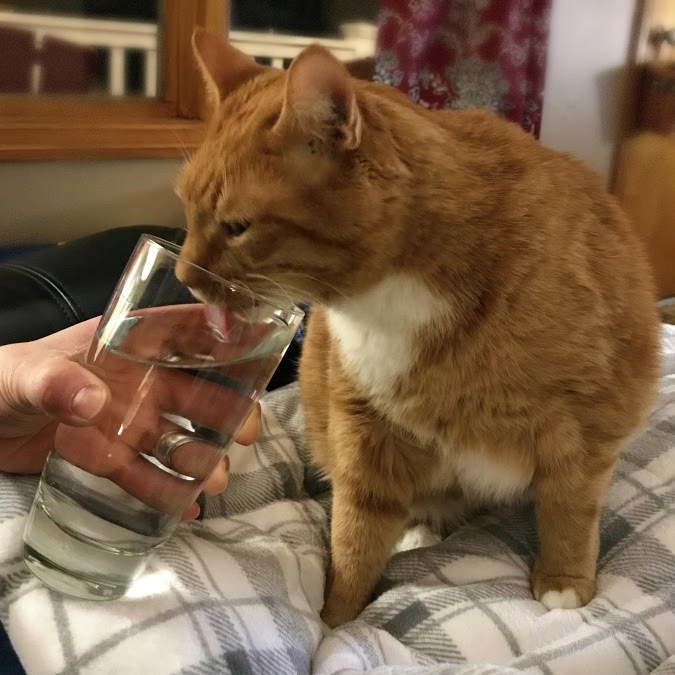 he also loves to drink water out of our water glasses. whenever we sit on the couch to watch tv we often have a water glass next to us. lately, leko has been fast asleep on our laps and wakes up all of a sudden out of a deep sleep so thirsty! he looks at us, looks at the glass, looks at us, looks at the glass, and needs us to bring it over to him for a drink. this happens a lot. i snapped a picture of this ordeal one night this week. what a silly guy! He is not getting off of the soft blanket for a drink. His butlers must fetch it for him. Maybe he should have a silver cup? So cute! He knows how to get what he wants!